This one-day foodie itinerary is the best way to get inside the world of Kyoto cuisine. 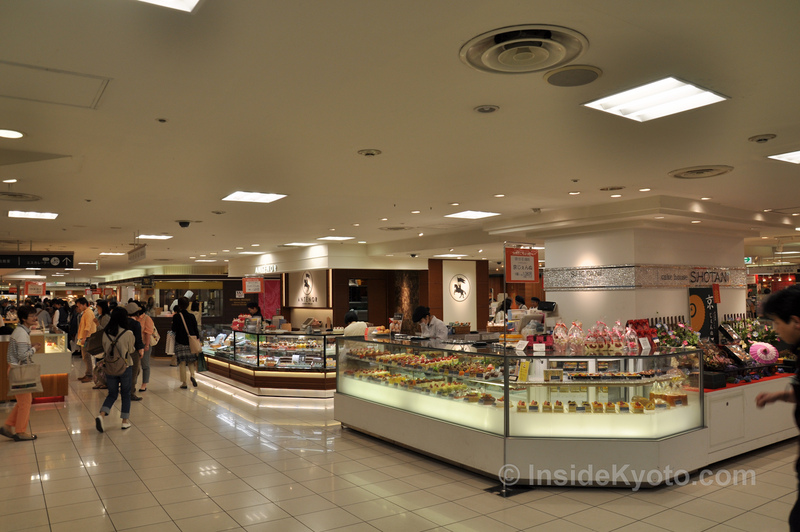 It includes three department store food floors, the famed Nishiki Market, and Kyoto’s best local shopping street. If you’re in a hurry, skip right down to the actual itinerary. Otherwise, please read the following background notes. First, some expectation management: Japan is not like Thailand when it comes to street food. 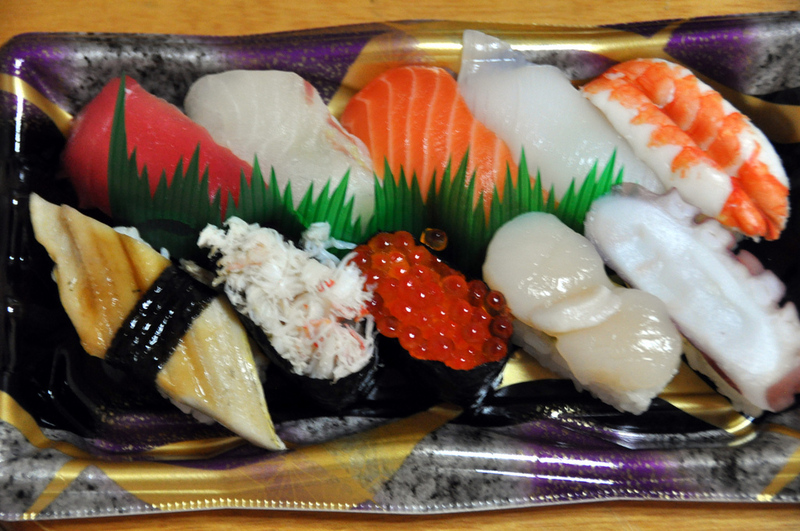 In fact, Japan is not really a street food culture. Yes, there is some famous street food in Japan, like tako-yaki (battered octopus chunks) and yatai (outdoor dining tents), but these aren’t big in Kyoto (try Osaka). And, to be frank, eating on the street is not even considered polite in Japan, especially for a woman. Next, please keep in mind that the places on this tour are all working markets. Try not to get in the way of shopkeepers and local shoppers. And, while food samples are available, it’s not cool to sample if you aren’t really thinking of buying (ie, these are not public buffets). The best thing you can do to keep things positive is to buy something as you go. Finally, just a word about this itinerary: We don’t recommend specific restaurants in this itinerary. Rather, choose a lunch spot from our Downtown Kyoto District page or just enter a place that looks good as you explore. For a caffeine break during the day, check our Tea in Kyoto or Best Coffee in Kyoto for some picks. In the morning, head downtown to the Shijo-Kawaramachi intersection and enter Takashimaya Department Store (if you get there right at 10am, you’ll catch the charming opening ceremony). Take the escalator down to the basement and check out the amazing food floor here. Take a full lap around to enjoy the full experience. Leave Takashimaya and walk one block west on Shijo-dori. Immediately after crossing Teramachi-dori, you will see Fujii Daimaru Department Store in front of you. Enter and take the steps down to the basement food floor, which is known as Tavelt Food Floor. This is a smaller food floor, but it’s worth a quick look, particularly for the incredibly ready-made sushi and sashimi section, which is at the back, on the right. This stuff is great for a picnic in a local park or beside the river. Exit Fujii Daimaru, cross Shijo-dori and enter the Teramachi Shopping Arcade immediately in front of you. Walk one small block and the first alley on your left is Nishiki Market. Hopefully, if you’ve arrived a bit before noon, it won’t be too crowded yet, but these days, Nishiki is crowded with tourists pretty much all day, every day. Still, since it’s the best market in town, it’s worth dealing with the crowds. And, you can duck out on a side street any time it gets too much. Take your time checking out the various shops selling tea, fish, pickles, tofu and souvenirs. There are several places in the market where you can buy snacks to go, including yakitori, juice, sashimi, tako-yaki and Japanese sweets. Visit our Downtown Kyoto District page and scroll down to the Places to Eat section. You’ll find plenty of good restaurant recommendations. Or, simply pop into a restaurant that looks good as you make your way to your next stop. If you want a good selection of all the Japanese favorites in a comfortable atmosphere (with English menus), you can head up to the Takashimaya Restaurant Floor or the Daimaru Restaurant Floor (these are known as “Resutoran Gai” in Japanese). Starting from the west end of Nishiki Market, simply continue west along Nishiki-dori for another hundred meters or so and you’ll see Daimaru Department Store on your left. Take the steps outside the main entrance down to reach the basement food floor. This place is a true Aladdin’s Cave of gustatory delights. 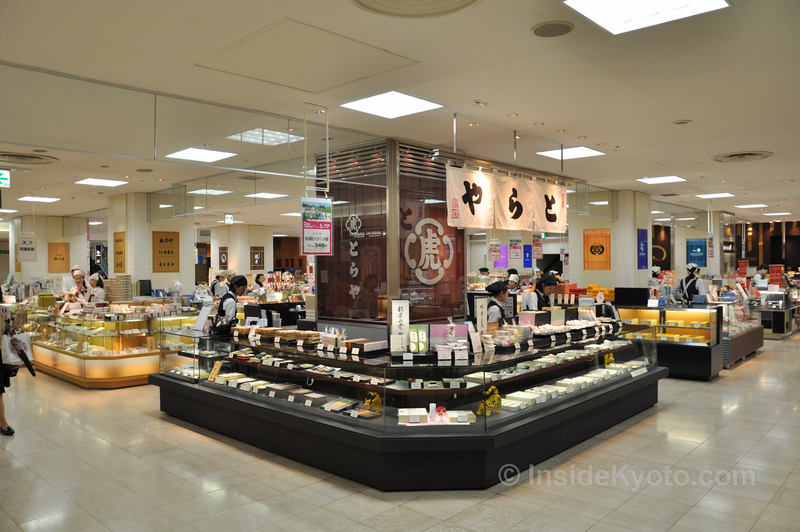 Be sure to check out both the Western and Japanese sweet sections, and then head over to the east side to check out the supermarket section (note the Y10,000 mangos etc). Exit Daimaru and walk west on Shijo-dori, crossing the wide Karasuma-dori and continuing until you get to the next wide street, which is Horikawa-dori. Cross Horikawa and turn right (north). Walk north for several blocks until you reach the mouth of Sanjo-kai Shotengai, which is Kyoto’s largest covered shopping arcade. The total walking time is 20 or 30 minutes to Sanjo-kai Shotengai from Daimaru. Note that if you don’t feel like walking from Daimaru, a taxi will take about 5 minutes and cost around Y800 (ask for “Sanjo-Horikawa”). 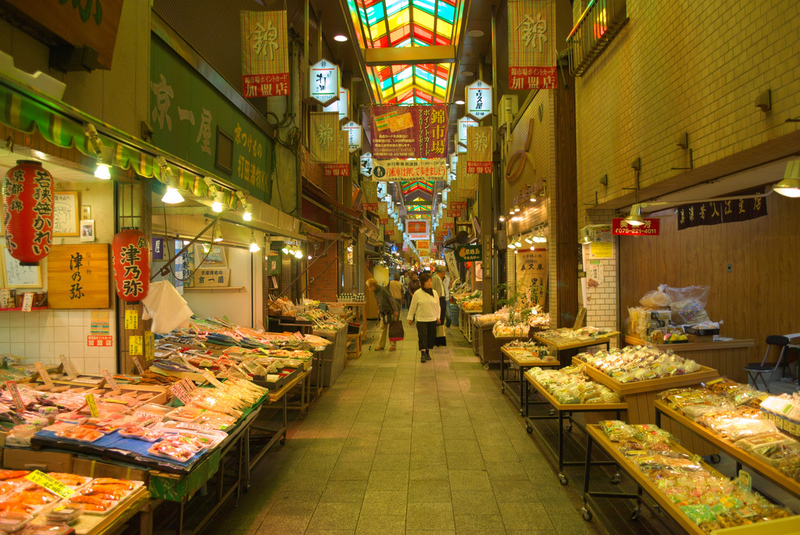 Sanjo-kai Shotengai is a real contrast to Nishiki Market, which has become inundated with tourists. 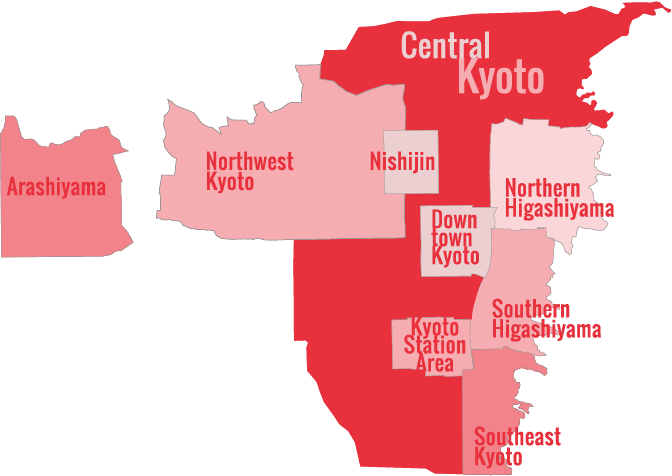 Here, you’ll see where local Kyotoites actually shop. 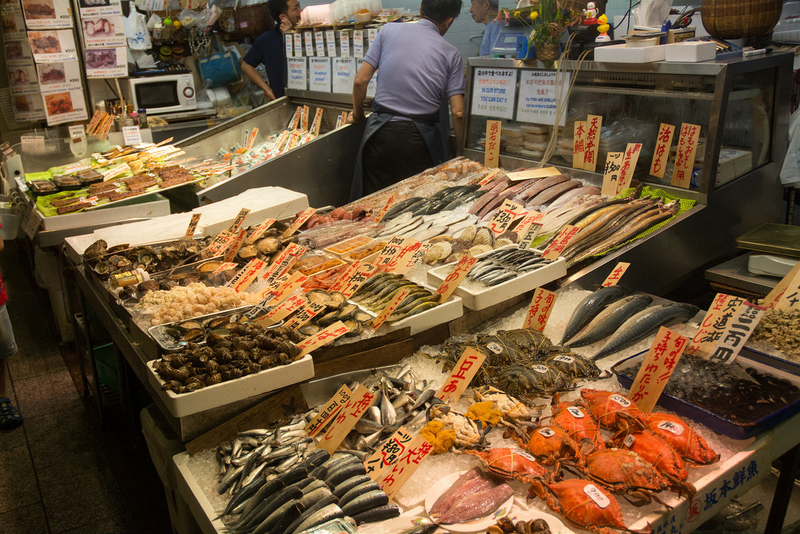 Keep your eyes out for fishmongers, tofu shops, sweet shops and an endless variety of other small shops. 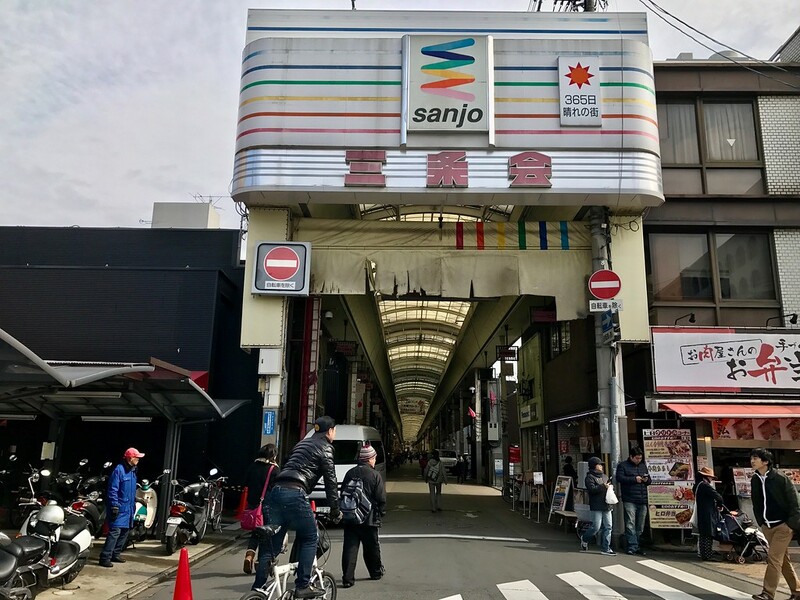 For all the details on this shopping arcade, visit our Sanjo-kai Shotengai Shopping Arcade page. For more Kyoto itineraries, visit our Kyoto Itineraries page. If you’re taking in Tokyo on your trip, see our comprehensive Tokyo Foodie Itinerary and my Tsukiji Market Walking Tour if you want an expert guide to show you around. For all-Japan Itineraries, visit our Japan Itineraries page.